Quite literally the burning heart of the Power Pallet, the pyroreactor is the core element of our gasifiers; the current generation–the version 5–was first introduced two years ago. The v5.02 incorporates various changes to the hearth, materials, accessories, and manufacturing methods. The most significant modifications changed the impact zone of the reactor air input, creating a more even and precisely located combustion zone. This results in more complete tar cracking that occurs exactly where we want it, delivering a robust 40% reduction in tar production over previous generations, as well as a significant reduction in clinkering effects. That means better performance and lower O&M costs. And because the changes are taking place entirely within the hearth of the reactor, there’s no change to external sizing and configuration, so the overall compact footprint remains the same. Another big innovation: a new secondary heat exchanger filtration system (seen here, at the far left of the Power Pallet), which reduces the amount of tar in the gas stream and increases the longevity of the power train. One of the features that distinguishes the Power Pallet from other gasification systems is our innovative and patented use of thermal management, utilizing “waste” heat from one process to drive useful reactions and processes elsewhere in the machine–for example, using the waste heat from gas leaving the reactor to dry feedstock before it goes into the pyroreactor. The heat exchange filtration system is another innovation in thermal management and heat recycling. After the gas is used to dry feedstock, it is routed through the inner tubes of the heat exchanger. The engine vacuum is used to simultaneously pull ambient air into the outer shell of the heat exchanger, where the temperature differential between the cool air and the hot gas allows heat to be exchanged, cooling the gas coming out of the reactor. This causes suspended tars and volatiles in the producer gas to condense and fall out of the gas stream before it flows into the primary filter. The heated atmospheric air is then routed through the engine’s air intake and mixed with the cleaned and cooled gas after it exits the primary filter. The heated intake air serves a second function, as it raises the temperature of the combustible air/gas mixture and thus avoids the condensation of water and other remaining trace tars entering the engine so that they can be completely combusted. The result is much cleaner gas pre- and post-filter, and a markedly lower O&M requirement for the engine. A few months ago, in another iteration on waste heat transfer that adds substantial value to the Power Pallet, we introduced a Combined Heat and Power (CHP) module. 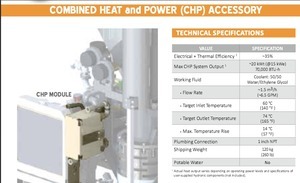 This CHP module uses the excess heat from the working fluid in the engine radiator and runs it through a heat exchanger. We provide hook-ups to the outside of the heat exchanger so operators can use that thermal energy to heat water and put it to productive use, like drying crops and other agricultural processes. An additional benefit of the CHP module is that is helps keep your engine running cool, reducing wear and tear. We have also ensured that the CHP module delivers its thermal energy load without any reduction in electrical power output, meaning you can now get 1 kilowatt hour of electricity and 1 kilowatt of heat out of the same 1.2 kG of biomass. 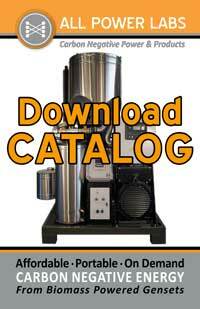 You can find more of the CHP module’s technical specifications and pricing here. The perforated grate basket is one of the core elements in the APL gasifiers. It helps maintain a char bed at the bottom of the reactor that is ideally suited to maintain gas flow and sustain the reduction processes that are critical to the production of combustible gases from biomass waste. Refresh your understanding of how this basket is designed to work. In order to ensure long uptime and reliability, we are now making the basket out of a very strong alloy of stainless steel, which resists corrosion and which our testing has shown is not prone to degradation. The stainless steel grate basket is an improvement that was driven directly by feedback from our customers. We were getting reports from the field that over very long periods of runtime, the exposure to high heat and corrosive gases, combined with constant agitation, was causing degradation of the mild steel in the previous version of our grate baskets. This solution now solves that issue. All Power Pallets now come with their electronics and feedstock hoppers ready to retrofit with an optional air lock system to enable easy automated filling for a customer-provided external feed system. If you want to use a manual feeding process with your new Power Pallet, you won’t notice anything different. But if you’re interested in integrating APL’s continuous feed module and external fuel handling system with a Power Pallet that you already own, you can now do it without changing hardware. Because the APL continuous feed module obviates the need for an operator standing by to refill the Power Pallet’s feedstock hopper, this change enables customers to lower their O&M costs and thus provides a lower cost per kilowatt hour. You can see that system in use on this project at the Hybridnet in Terni, Italty. There’s now a larger ash collection vessel for 24hr+ continuous run times, strengthened materials in the flare and exhaust, backfire-suppressing wiring and software changes, increased grid tie module control, an upgraded oxygen sensor, and much more. We also focused on usability issues, like adding an easily-accessible, weatherproof documentation holder right on the Power Pallet and improving the PCU automation interface. All told, there are more than 30 changes and improvements to the Power Pallet in the last few months. With every improvement we make, we strive to ensure backward compatibility wherever possible, so it’s easy to upgrade your existing system to the latest performance. We’re expanding our team, and are looking for both engineering and sales support in our Berkeley headquarters. Read the details about the positions here–please feel free to share and forward these job announcements. Our March Open House will be held Friday the 11th, from 5-7pm. Come see the above improvements in person, learn about what’s coming next, and get your questions about gasification (or working at APL!) answered. Cold beer, hot pizza, and cool technology. Free to the public; please RSVP here so we know how many to shop for. Jump into the fiery world of applied biochar with this immersive workshop for land managers, gardeners, farmers, policy makers, soil builders, and climate activists, being hosted by PLACE in Oakland, Ca. See examples using biochar for wastewater filtration, rooftop farming and vertical gardening . TO REGISTER: Please go to http://aplaceforsustainableliving.org/support/and click on our gold “Donate” button on the middle of the page. Questions? Email us at: info@aplaceforsustainableliving.org with “BIOCHAR Workshop” in the subject line. Thank you for your continued interest in All Power Labs, the Power Pallet, and the exciting new renewable frontier of biomass gasification technology. Please contact us with any questions about these design changes or to discuss your project, at info@allpowerlabs.com.